Our classic clamshell tankini style offers extra coverage for our demure mermaids! Featuring complete mid-section coverage with straps that tie around the neck, this top is designed to coordinate beautifully with Jia's Asian Magenta and several of our Limited Edition tails! And if you're looking for the perfect Little Mermaid look, pair this top with Brynn's Celtic Green mermaid tails! Love the look of a solid-colored swimsuit top in a tankini style? Then you’ll flip for our dark purple mermaid tankini top. When paired with our Asian Magenta bikini bottoms, you’ll have a complete look that’s so flattering! 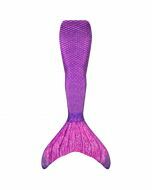 Add the mermaid-scale tail and you’re set for a water adventure! Your friends and family will adore your new mermaid transformation (and will probably want to transform into a mermaid, too).